Application: You can view, print or download our Application for Residential Treatment here. 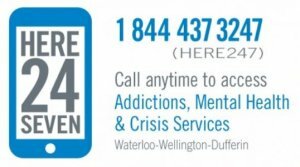 If you are applying for a residential program at Stonehenge Therapeutic Community and you live in the Waterloo-Wellington region, you must call the Here 24/7 Referral Service at 1-844-437-3247. If you live outside of the Waterloo-Wellington region or are on probation or parole, you must submit a completed application and call Stonehenge to set up an assessment. If you are currently incarcerated, you should speak with your worker/parole officer to have them send in your completed application.